In the United State's Major League Baseball history, there is seldom a more controversial figure than Pete Rose. Rose was one of the greatest baseball players in the history of the game, holding the record for most hits in a career. The number, an amazing 4,256 hits, is unlikely to ever be broken. 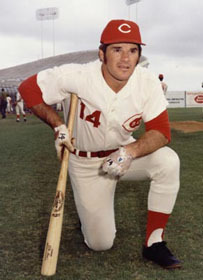 Yet Pete Rose also showcases the dark side of baseball, as he was banned for life and denied entry into the Pro Baseball Hall of Fame due to his gambling habits. This didn't stop Vince McMahon from deciding to use Rose in the World Wrestling Federation, however. At Wrestlemania XIV in March '98, Rose came out as the special guest announcer before the Kane/Undertaker grudge match. However, Rose became distracted by the crowd during the announcement, taking time to insult the Boston fans in attendance. Kane then came out and got in Rose's face, surprisingly Tombstoning the legendary baseball player (to the roar of the fans)! Rose was helped out of the ring, as Kane would later lose to his brother, the Undertaker. This wasn't the end of Rose's wrestling saga, however. A year later, at Wrestlemania XV, when Kane came out to compete against Hunter Hearst Helmsley, he was surprisingly attacked by the San Diego Chicken, a popular mascot. Kane quickly got the upper hand and showed that the Chicken was actually Pete Rose, trying to get some revenge! It didn't work out that way, though, as Kane again Tombstoned Rose, taking him out. One year later, at Wrestlemania XVI in April '00, Kane teamed with Rikishi to defeat X-Pac & the Road Dogg. After the match, Kane & Rikishi were joined by Too Cool (Scotty Too Hotty & Grandmaster Sexay), as well as the San Diego Chicken, which quickly caught Kane's attention. But Rose wasn't inside the suit; instead, he came out of the crowd and attacked Kane from behind, only to once again get caught by the Big Red Machine. Kane landed a Chokeslam on Rose, then put him in position to get nailed by Rikishi's Stinkface, ending Rose's tries at getting some dignity back. 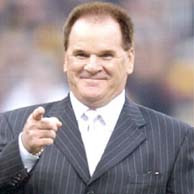 It was announced early in 2004 that Pete Rose was going to be the first inductee into the Celebrity Wing of the WWF Pro Wrestling Hall of Fame. Rose was introduced into the ceremony by his 'arch-rival', Kane, finally getting the satisfaction of being able to claim he was a Hall of Famer. Whether or not Rose is ever allowed into baseball's Hall of Fame, he at least has one honor to hang onto, thanks in no small part to his ability to withstand punishment. - WWF Wrestlemania XIV (March 29, '98) = Rose, as the guest announcer, was Tombstoned by Kane. - WWF Wrestlemania XV (March 28, '99) = Rose was again Tombstoned (this time in a Chicken suit) by Kane. - WWF Wrestlemania XVI (April 2, '00) = Rose was Chokeslammed by Kane and given the Stinkface by Rikishi.